URBAN MARKET * give away 3 CHIPBOARD TC XYRON PUNCHES and 3 TC Urban Market paper collections!!!!!! Teresa Collins segment with www.mycraftchannel.com and BIG GIVEAWAY today...... Teresa Collins and XYRON will give away THREE of the TC Xyron PINK chipboard punches and THREE Urban Market paper collections to three lucky loyal fans and viewers. Go to Teresa's facebook page today and comment to win. as well as XYRONS facebook page. photos. 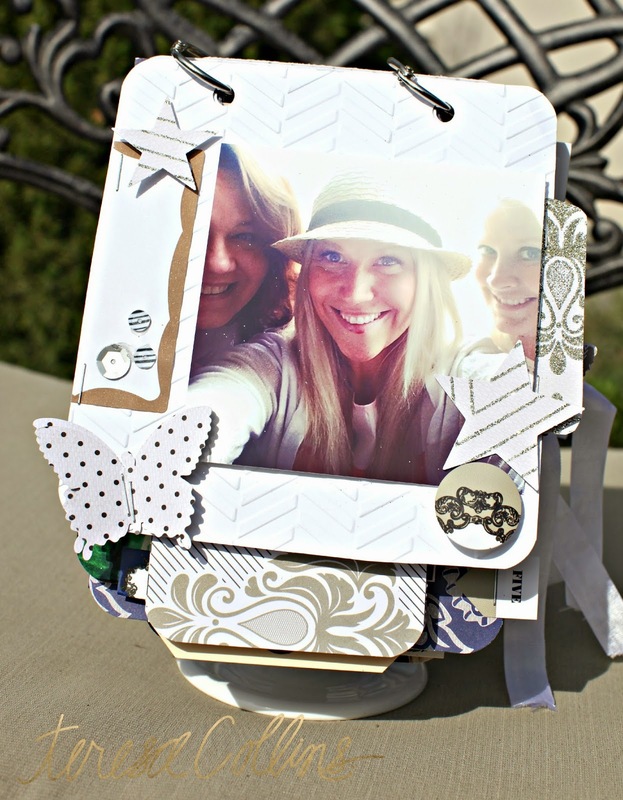 Learn how the chipboard punch will make the project easy to create and display the memories." Adhesives- XYRON TC adhesive kits and PINK chipboard punch. different ways and is not gender specific. I love this collection! It is great for doing masculine things with which I don't do a lot due to the fact I have 2 girls so there is a lot of pink! I love Urban Market - very elegant! It goes perfect for our last family photos. I also need to get me one of those hole punches. I so enjoy watching you on My Craft Channel. You do beautiful work. Wow, Teresa great collection. I just love all of your collections and wish that I could have them all, ha! I am loving the glitter. I like that your tools are pink and the chipboard punch would come in handy. Thank you so very much for this beautiful giveaway! With all you have on your plate with the family, that you can still be so wonderful to us is such a blessing!!! Your family members are in my prayers! This project is so perfect! Love the flip up album as it serves as decoration and a memory album. The punch is great for doing this so that you can just punch through the pages and in such a short time you have a beautiful décor piece for everyone to enjoy. This line is so beautiful. Thanks for the chance to win. I have been a loyal fan of yours since the beginning! 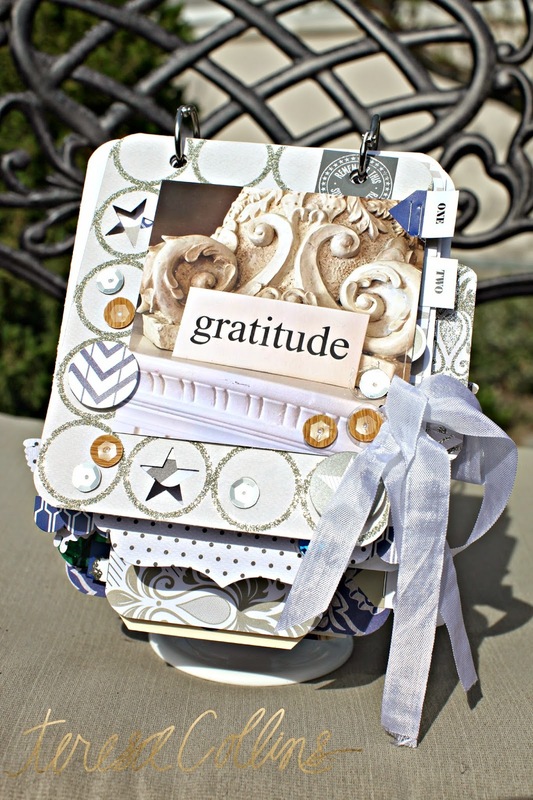 Gorgeous embossing & love the fun project! I love how you always include some glittery items! Beautiful project. And thanks for the terrific giveaway! Just saw the Urban collection this weekend at Creative Cards & Crafts in Villa Park, IL this weekend. I'm in love with this line! Can't wait to start playing with the stuff I bought this weekend! Urban Market is the best collection - Ever! Wonderful to have a chance to win it. You are in my prayers. Love this paper line, best ever! Prayers! Elaine in Georgia. I just love all of your product lines!!! Can't live without them! Thanks for a chance to win MORE! Great collection. Thanks for the chance to win! Great collection, great color, great pattern and.... awesome project to show your new collection! Thanks for a chance to win and the inspiration today! LOVE, LOVE, LOVE your lines. And your Strength. Thanks for a chance to win. Love all of your collections. But I have to say I do love The Urban collection! Thanks for your inspiration and for the chance to win a great product. You know I love this collection and I would be so thrilled to win. I think it would be great for a graduation memory book for my oldest grandson. All GREAT collections! Love Love Love!! Such amazing inspiration! Love all of your designs ! I'm a huge fan ! Mother of seven hanging on to life and enjoying every minute of the ride. Documenting as I go !! This line is so Beautiful! I really love it. 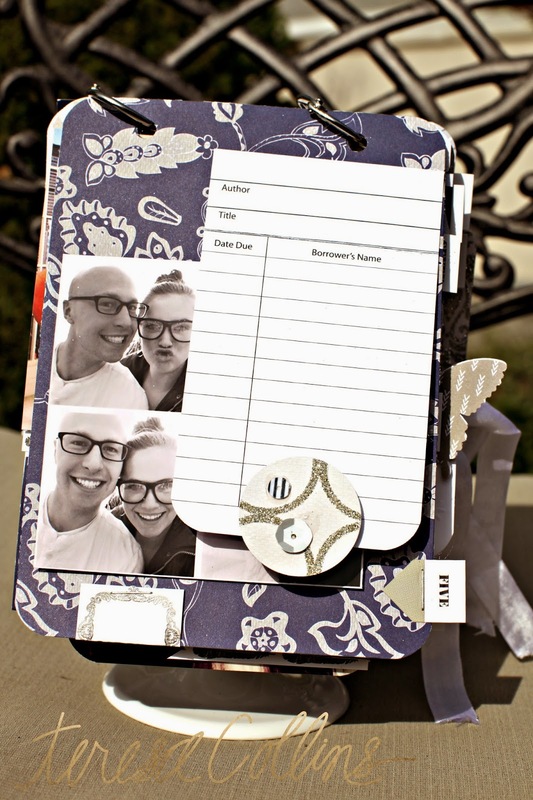 Such a cute project with the Ikea frame (I have some and haven't used them) and the chip board punch. Thanks for the chance to win. The colors are so beautiful, perfect for this summer, LOVE the entire collection, thanks for the chance to win !! I LOVE Teresa Collins paper! I just LOVE it. This line looks amazing like all of them! I simply adore your URBAN MARKET collection! As ususal I love the way you are so creative! I would very much love to win this giveaway! All the best to you! Love the URBAN MARKET! I have already stocked up on the items and will be ready to put it to good use soon! Teresa, I just wanted to say you are one very brave and strong woman, and an inspiration to us all. You and your family are in my thoughts and prayers. Beautiful line! Love the colors and the details! Love your Urban Market collection - thanks for the chance to win. Congrats on the great news of a donor, I've been praying for your and your family. Thanks for the chance to win any of your great products. So very happy to have read all the wonderful news! Keeping everyone in my prayers! LOVE Urban Market (I have 2 boys so it works great for their layouts!) Thanks for the chance to win! Love the blue in this collection. Thanks for the opportunity to win. All your collections and products are so beautiful! I would love to win something - thanks for the chance! Love this collection. I have so many ideas on how I want to use these floating in my head. I absolutely love Urban Market. The blue color is so beautiful!! I luv it and want it all! glitter is better than anything else out there!!! I love love love your collections. I'm a glitter fanatic! I'm heading to Ikea now for a photo stand to alter!!! Winning anything would be nice! Thank you for the opportunity. Beautiful collection! Thanks for the chance to win it…hope all is going well with your husband's treatment! I buy every Teresa Collins collection and love them all- would love to win Urban Market as I don't have it yet! I'm already picturing a mini for my first grandson who is due in July. Urban Market is beautiful. Blue is my favorite color. My house has always been decorated in blues. I would love to win this collection & the amazing chip board punch. What a cute look. I love the library book card. This is a great collection for guys, too. Love this Urban collection is awesome! So versatile! I'd love to win this great prize! I would love to win this collection from Teresa! Teresa, I love your collections! And I love you! I would be so happy to win this. Love the project-and all the golden goodness! Yeah, baby! Pick me, pick me. Thanks! Urban Market is gorgeous. Trying to embrace the gold! Love ya bunches. Thanks for the opportunity to win a fabulous collection and a great punch! WooHoo! Thanks for the great giveaway! The collection is wonderful! Love Urban Market! Prayers for Ty, you and the family. Expecting nothing but great reports!! Awesome collection! Just my style! Thanks for the chance to win! What a wonderful collection!I love the derp blues +of course the glitter! How can entering be so easy to win such a neat prize package...THANK YOU!!!!!!!!!! Another wonderful collection. so many possibilities. I've got my frame and my drill now just need to win the punch and the papers. Thanks for chance to win. I will see you in St Petersburg FL on Tuesday the 10th can't wait for the class.!! What a beautiful collection. I love it. Thank you Teresa. This collection is wonderful!! Sending prayers for Ty and your family!! Urban Market is right on trend because of the great gold mixed in this collection. I would love to play and make some beautiful stull with this collection. I love all your collections! But Urban Market is one of my favorite's because of the amazing blue...no one else has blue like this in their collections! Stunning! Love the blue.. awesome prize Teresa!! Hugs and Prayers!! Would love love love to win this! So cute! I would be ecstatic to win your anything in any of your collections!!!!!! this is an awesome collection, I hope I can get my scrappy hands on it!!! very awesome examples! Awsome collection! Love it. Really beautiful. Prayers to Ty, you and family! Sorry I deleted my comment by accident. I love this collection. I want to make a scrapbook of our cruise with this line. I picked up a couple of the display stands a while back so I would have them when I found the right project. I would love to win this. Thanks so much for the opportunity to win. I don't know how you keep up with everything you've got going on right now. We are keeping you and your family in our thoughts and prayers. Great collection and punch. Love that the punch is in pink. The papers are beautiful. Gorgeous collection. Love the colours and the glitter/sparkle. Thanks for the chance to win - you are so generous! I would LOVE to win! I need new scrappy toys! :) Love the new collection. Need it! Want it! ha, ha. What a beautiful collection and I love the mini album! Gorgeous collection! Thanks for the chance to win. I just read the great news!!!!!!!!!!!!!! I can't imagine how thrilled you are! I love Urban Market and how you are able to make something not only to scrap but display for everyone to see! I love the colors of urban market!! I love Urban Market! My favorite color is Navy Blue! I have been so inspired by your products! You have brought joy back to scrapbooking! Your message is about telling your story. I can't wait to tell mine! Love the Urban Collection. My new favorite. Love the colors. Love the Urban Market because of its deep blues and brilliant blues! Wouldn't it be awesome with ocean and beach pictures!! Would love to use it for my Florida Keys pics from my vacation! Thank you for your sweet inspiration and wonderful collections! I bought a few of those stands - love this collection! I think the collection is gorgeous. elegant.